The 2018 1 oz. gold Krugerrand is among the latest releases from one of the world’s oldest and most popular bullion coin programs. Since its release by the South African government in 1967, the 1 ounce gold Krugerrand has become one of the most trusted and widely traded forms of gold bullion. Trusted Heritage – The Krugerrand has been around for more than 50 years and is instantly recognized by investors and collectors around the world. Guaranteed by the South African Government – Gold Krugerrands have the rock-solid backing of the South African government. Investment-Grade Gold – Krugerrand coins are struck in 22-karat gold. Tangible Wealth – Gold coins such as the Krugerrand represent real wealth, providing you insurance against the daily whims of world currency and financial markets. While there are millions of Krugerrands around, few are good enough to enter our inventory. Many Krugerrands are dinged and scratched, and this not only has a detrimental effect on the appearance of the coins, but it can also nibble away at the amount of precious gold content they actually contain. Why would you want to buy a bullion coin that has substandard surfaces and possibly lower gold content than advertised? Resident Universal Coin & Bullion expert Dr. Michael Fuljenz has many decades of experience in handling the world’s finest bullion coins, and he knows what a quality coin looks like when he sees it. Dr. Fuljenz, who has proudly earned the title of “America’s Gold Expert,” is a noted speaker and award-winning author who has appeared on Fox Business News, Bloomberg TV, and CNBC. He and his team of gold experts ensure every Krugerrand that enters the inventory at Universal Coin & Bullion meets their unsurpassed standards of eye appeal and overall quality so that you receive only the best coins. In addition to offering top-quality coins, we also offer free shipping on all online orders over $99, helping you get the most from your investment dollars when you buy gold Krugerrands from Universal Coin & Bullion. We ship all orders in secure, discreet packaging so you’ll never need to worry about the safety of your purchase while your shipment is in transit. If there’s any reason you need to reach us about your order, our customer service team is here for you. You can expect nothing less than a completely worry-free experience – something that has helped Universal Coin & Bullion earn a coveted A+ rating from the Better Business Bureau. Invest in 1 oz. gold Krugerrand coins from Universal Coin & Bullion today. Contact us toll-free at 800.822.4653 to order your 2018 1 oz. gold Krugerrand coins before prices soar! The 2018 1 oz. 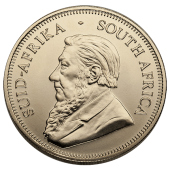 gold Krugerrand is named for Paul Kruger, the individual seen on the obverse, or “head’s side,” of the coin. Paul Kruger, officially known as Stephanus Johannes Paulus “Paul” Kruger, was one of the most famous political and military figures in South African history. Of Dutch descent, Kruger is regarded as a key builder of the Afrikaner nation and served as the president of the South African Republic (Transvaal) from 1883 until 1900. On the reverse (“tail’s side”) of the 1 oz. gold Krugerrand is a springbok antelope (Antidorcas marsupialis). The beloved springbok derives its name from the Afrikaans word “pronk,” a reference to the animal’s characteristic tendency to leap. The springbok is South Africa’s national animal, and thus has earned its rightful place on the reverse of the Krugerrand gold coin.